Aug. 4 was the 100 year anniversary of Britain’s, and therefore Canada’s, declaration of War against Germany. But how did it feel to go through that war in our own community? Many young men from Manitoba marched onto the troop trains in the fall of 1914–singing, cocky, even swaggering–and with absolutely no idea of what awaited them. 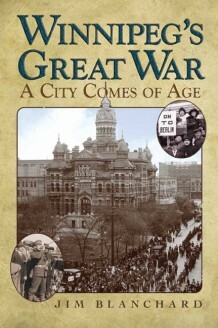 Jim Blanchard’s admirable book, Winnipeg’s Great War: A City Comes of Age tells us with thoroughness and restraint exactly what awaited them and how their parents and friends and the elites of the city reacted to the news from the front that was increasingly distressing after the first huge losses of April and May 1915. First published in 2010, Blanchard’s book is receiving renewed attention because of the centennial. He weaves two separate strands together. The first is the participation of the Canadian military in the war with special emphasis on the regiments raised in Manitoba: the Fort Garry Horse, Lord Strathcona’s Horse, the Winnipeg Grenadiers, the Cameron Highlanders, the Winnipeg Rifles and others. The second strand follows the home front in Winnipeg as the realization sank in that the war would not be over by Christmas; that it would be hard fought and take years to resolve. We have had a century to pour over the events of World War I. It would be hard to find anyone now who regards it as anything other than a catastrophe. Yet Blanchard shows that while the war was going on and well into the 1920s, Winnipeggers by and large supported the War and felt that victory had been worth the sacrifice. Winnipeg’s business class funded regiments, raised millions of dollars, provided the first Returned Soldier’s Association in the country, and stoically waved their sons and daughters off to war. The book is particularly strong on the contribution made by women in those efforts and as nurses closer to the action. Yet the ample quotations from letters, diaries and newspaper reports are what really bring the war experience to a 21st century reader. Alec Waugh writes angrily from the front about his friends who are able-bodied but have not yet enlisted. A returned wounded man tells a newspaper reporter about the image of a particular German he shot, how that image repeats over and over in his mind. Private George Macleod, who lived the next street over from where I now live, is one of many listed as wounded from other familiar streets in a newspaper casualty list. The book’s subtitle, “A City Comes of Age,” can be read several ways, as Blanchard surely intended. It was a hard and bitter coming of age, during which people simply had to hang on to the belief that their sacrifices were worthwhile or they could not have done the things necessary to bring the war to an end.